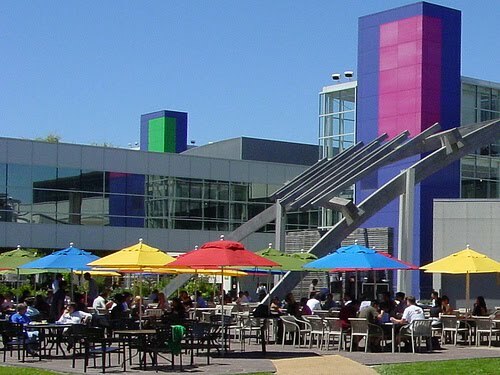 Google wants to turn its Silicon Valley campus into Googletown. The company will build out the equivalent of more than two TransAmerica Pyramids on the site of a federal space base in Silicon Valley. Though Google's plans at NASA Ames/Moffett Field have long been simmering, a Freedom of Information Act Request from the San Jose Mercury News shined new light on the company's plans. Google is now revealed to be planning up to 180,000 square feet of housing at Ames, or 15 percent of the usable space on the 42 acre development. And the company is pressing for still more housing in the adjoining city of Mountain View, where its headquarters sprawls across 65 buildings. Google is pushing Mountain View officials to change zoning so more housing and retail can be built around its suburban, office-park-ish HQ. It's not clear who would build this housing. But, conveniently, Google has its own developer, Planetary Ventures, which handled the Ames deal.